Roof replacement is not something to take likely, nor is it a repair that should be delayed. When you sense that your roof is nearing the end of its useful life, brush up on these basics before soliciting bids from roofing contractors. Your choice of roofing materials often depends on your locality, as much as on your own personal taste. In some regions, for example, metal roofing is a common selection due to its fire resistance, while in other regions, the predominant home styles might call for a Spanish-influenced tile tool. Roof pitch (angle) also affects the kind of roofing materials you can use. For example, wood shake shingles can be used for steeper pitched roofs but are not suitable for flatter, low-pitched roofs. Asphalt composition shingles: These are cheap and easily obtainable, but they are less attractive than other options due to their flat appearance. This is by far the most popular type of roofing material. Wood shakes or shingles: These are pricey but attractive shingles. They have great durability but aren't a good choice in regions where there is a fire danger. Metal Roofing: Metal roofs made of steel or aluminum have become more popular in recent years, due in part to their durability and because they are fireproof. These are expensive roofs that require specialty contractors for installation, but they may be cost-effective over the long run due to their long life. Several types of metal roofing systems are available, including raised-seam panels and products that mimic the look of composite shingles. Slate roofing: This is a highly attractive, high-end roofing option, but it is expensive and very heavy. Slate roofs are extremely slippery to walk on and difficult to repair when damaged. Composition slate: These synthetic tiles made from 95 percent recycled materials, including rubber, are gaining in popularity. They closely resemble slate and other forms of stone tile but are much lighter and less susceptible to damage. Clay or ceramic tile: Long the most predominant image in Southern California and Florida, the so-called Spanish-style red tile roof is still common but is being gradually replaced by metal and composite materials that mimic the Spanish tile look. Other roofing materials are now available which meet ceramic tile's fire retardant ability, with much less weight put on the roof. This type of shingle is called the half-barrel because it is essentially a cylinder cut in half length-wise, roughly 16 inches long. Tear Off or Second Layer? Weight: The main argument against laying additional layers of asphalt shingles is that the roofing materials can get too heavy for the underlying roof framing. This can be a structural problem, especially for older houses. It is often said that a triple layer of asphalt shingles is equal to a single layer of slate shingles—an exceedingly heavy type of material. Telegraphing: Another problem with shingling over existing shingles is that you are essentially repeating some of the surface irregularities that may already be present. If you’re contemplating putting on a new roof, there’s probably a good chance that you may have bubbles, bumps, and waves that should be remedied. Putting new shingles over existing problems can leave you with a rather unattractive new roof. One way to minimize this problem is to go over the old roof and correct as many problems as you can before re-roofing. It doesn’t take much more than a hammer, some roofing nails, and a handful of shingles to correct bumps, gaps, and protruding nails. Work and waste reduction: The primary advantage of layering is that it reduces the work involved. Stripping off the existing layer and then laying down a new layer adds more work to the process. This isn't a real problem if roofing professionals are tackling the job—they can strip most roofs in a morning—but if you’re doing the job yourself, it can be a strong argument for roofing right over the old roof. Several factors go into the cost of a roof, beginning with your choice of roofing materials (ranging from cheap three-tab asphalt shingles up to architectural shingles or even slate). The roofing contractor you choose, the pitch (steepness or your roof), and the square footage of your roof are other factors that affect the cost. Rock-Bottom, three-tab composite roof for a small home may cost as little as $7,000. Nationally, a typical roof using architectural asphalt shingles costs between $3.50 and $5.50 per square foot—a cost that includes all demolition, permit fees, waste disposal, and cleanup. A well-coordinated roofing team is an amazing thing to watch—and this is why we pay them to do our roofs. 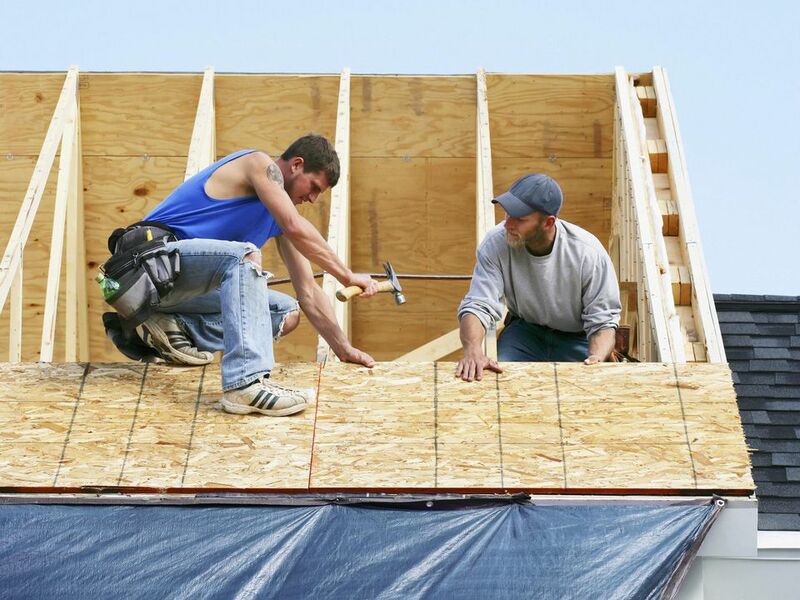 While in most parts of the U.S. the optimal roofing season is from late spring to early fall, skilled crews are able to extend the work season, sometimes even roofing when snow flurries are threatening. There is no reason, in other words, not to hire a skilled crew to roof your home during off-season periods. You may even enjoy lower prices at these times since the labor demand is low. The trick behind getting your roof job shoehorned into the offseason is having a large team of professional roofers who can knock out the work in hours, instead of days, thus taking advantage of dry periods. Remove all existing shingles, deposit them in a roll-off dumpster. Damaged or old valley flashing and drip edging is also removed at this time. A good crew will use protect foundation plantings and shrubs during tear-off and will use magnetic tools to pick up nails and metal objects from the lawn. Make minor repairs on the roof if it is in good condition. If not, replace bad wood with new plywood sheathing or 1 x 6 sheathing boards, whichever is applicable to your type of roof. Install ice dam protection in regions that require it. Ice guard membrane is a synthetic waterproof barrier material designed to prevent melting ice from backing up under the shingles and penetrating through the sheathing, where the moisture can cause severe damage. Lay down asphalt roofing paper over the roof sheathing. The layer of roofing paper creates an inner barrier against water penetrating into the house. Rows of roofing paper are overlapped as they progress upward toward the peak, and are normally tacked or stapled in place. Apply metal drip edging around the edge of the roof, both the eave sides and gable sides. The metal drip edge is nailed in place over the roofing paper or ice guard. Where necessary, apply new valley flashing along areas where two roof planes meet. The valley flashing is typically nailed to the roofing deck and sealed with roofing caulk. Apply the tab shingles, starting at the eaves and working upward toward the peak. Where roof vents are being installed, these are installed as the shingles progress toward the peak. Apply flashing around all areas where leaks might come into the house—against the chimney, around skylights and stack vents, etc. Flashing installation may happen as part of the roofing installation, occurring as the rows of shingles progress upward on the roof deck. Install the ridge vent. This continuous vent along the peak of the roof will help air circulation in the attic space and can be integral in exhausting hot air and preventing winter ice dams. Ridge vents may not be included on older roofs, but installing them is a good idea whenever a house is re-roofed. If ridge vents are not practical, the should be other types of roof or gable vents installed to provide air circulation in the attic space. Complete the final cleanup and haul debris away. Have the installation inspected and approved by a building inspector? The term square, when used in the roofing business, is a unit of area. One square equals 100 square feet. Shingles come in bundles. Three or four bundles of shingles typically will cover a square of roofing area.